It’s not an easy task to build an all-new airport terminal, but doing so while the current airport is still fully operating and passengers are checking in, boarding and taking off like clockwork is even more difficult. That’s what happened as the integrated Terminal 2 (T2) at Mumbai’s Chhatrapati Shivaji International Airport was being constructed—the existing half-moon shaped airport was still heavily in use. But this was only one of a series of hurdles during the build. In 2006, GVK, one of India’s largest private-sector airport operators, won the bid to build and manage the Mumbai airport. “It had huge challenges, not the least of which was the lack of sufficient land, making it the most constrained airport in the world,” says GV Sanjay Reddy, vice chairman of Hyderabad-based GVK Power and Infrastructure Limited. Only 1,400 acres was available for operations, as opposed to the 2,000 acres the airport tender announced (the difference of 600 acres was occupied by slums). Thus, the original plans had to be rethought. Reddy decided to think of the constraints as an opportunity to truly innovate: his new dream became to set a new trend in airport design and to bring pride to the people of Mumbai. The small size would compromise efficiency or aesthetics. Skidmore, Owings & Merrill, the firm behind Dubai’s Burj Khalifa and the One World Trade Center in New York, created the design plan for a distinctive X-shaped structure, which allows for two-way docking of aircraft and passenger bays. GVK broke ground in February 2009, but not without its share of hiccups. Some of which included the fact that the Mumbai airport has two intersecting runways, which means that neither could be completely closed for the duration of the widening. Instead, they repaved the intersection on Tuesdays between 11am and 5pm, allowing only small aircrafts that can land on shorter runways, to fly. Many travellers may be unaware that one of the runways at the airport is built over River Mithi. The original channel, which allowed the river to flow underneath, couldn’t withstand the torrential rains that beat down on the city in 2005—the runways were flooded under almost 2.5ft of water, and muck had settled into the radio and lighting equipment. When the construction was in full swing, a decision was taken to build a second channel that could take excess water. The existing underground waterway was also widened to allow more water to flow through. With 6,000 works, the Jaya He GVK New Museum is touted as the world’s largest public-art project outside a museum. Passengers were welcomed into the new terminal in February 2014. It certainly was a moment of pride: T2 boasts a white peacock-inspired contemporary design theme with some truly aesthetic elements, including water bodies and lotus light fixtures. The old terminal could handle 9.93 million passengers annually; T2 is capable of taking 40 million. The number of flights it can handle per hour has risen to 52 (from 30) owing to runway and airfield efficiency. “Terminal 2 integrates an iconic design with operational efficiency. It reflects modern India like no other building in the country does,” Reddy says. Mumbai airport now also welcomes the world’s largest passenger jet, the double-decker Airbus A380, as the runway has been strengthened and re-carpeted to handle its weight. Singapore Airlines and Emirates operate A380s to and from the city. But perhaps the most well-known feature of the airport is its magnificent display of Indian art. Jaya He is touted as the largest public-art project in the world (outside a museum); it hosts 6,000 works sourced from every state in India. Many are antiques dating back to the 18th century (a personal passion of Reddy and his wife, Pinky). Other works are by contemporary artists such as Riyas Komu, Mithu Sen and Anjolie Ela Menon. 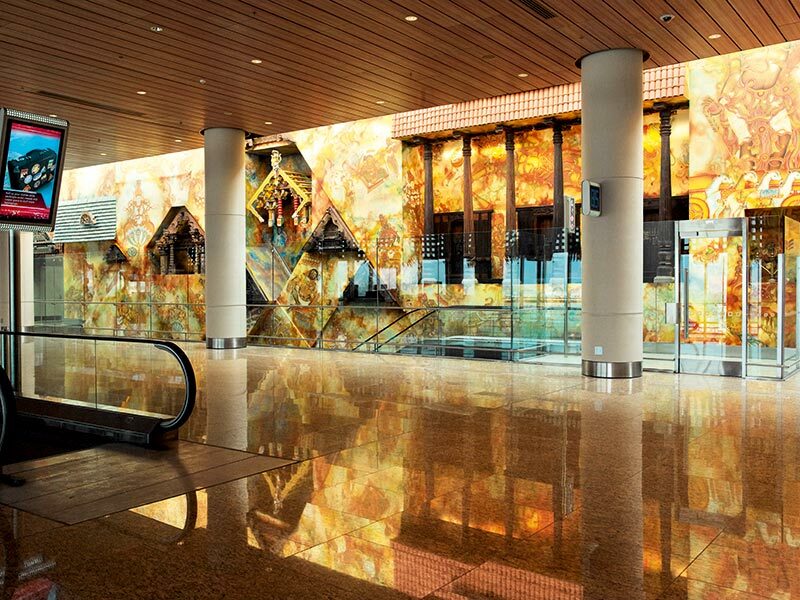 A single 3km-long wall showcases 97,815sqft of art, curated by Rajeev Sethi. “The wall is holding about 700 tonnes of artwork put together,” explains Sukhvindar Singh Chaggar, general manager of project construction. Divided into six sections, the wall features art curated from all over the country by Rajeev Sethi, telling the story of India under six broad themes—India Moves, India Greets, India Elemental, India Global, India Silent Sentinels and India Seamless. Antique doors and windows were sourced for the India Greets section, while India Seamless features work that paired artists with craftspeople from various parts of the country. T2 is also LEED Gold certified (it’s also the first airport to use biofuel), and its GVK Lounge was awarded the world’s best First Class lounge at the 2015 World Travel Awards. (T2 has unique, combined lounges across all airlines, another bold decision by Reddy.) In October 2015, phase 3 of the airport opened, allowing Air India to shift most operations there. Tellingly, the Airport Service Quality rating has gone from 3.3 out of 5 in 2006 to 4.98 in 2015. “We converted an adversity into an opportunity by bringing to the fore India’s biggest strength: its tradition of art and design,” says Reddy. And, he adds, most importantly, it brings pride to Mumbaikars who pass through its glass façade.